As my third and final stop on the Scholars Columbus To Do, Kaitlynn and I decided to stop by a small vegan bakery called Pattycake Bakery. Pattycake’s goods are all plant based products, but I could not tell the difference! 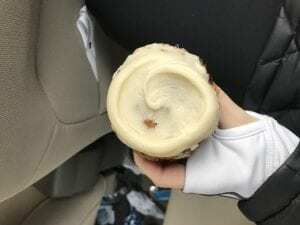 I got a carrot cupcake topped with cream cheese frosting, all vegan of course, and it was delicious! My family has always loved carrot cake, especially my sister, and we have made it vegan before… but it never tasted this good! As we arrived to the bakery, so did a small bus full of people doing a food tour. 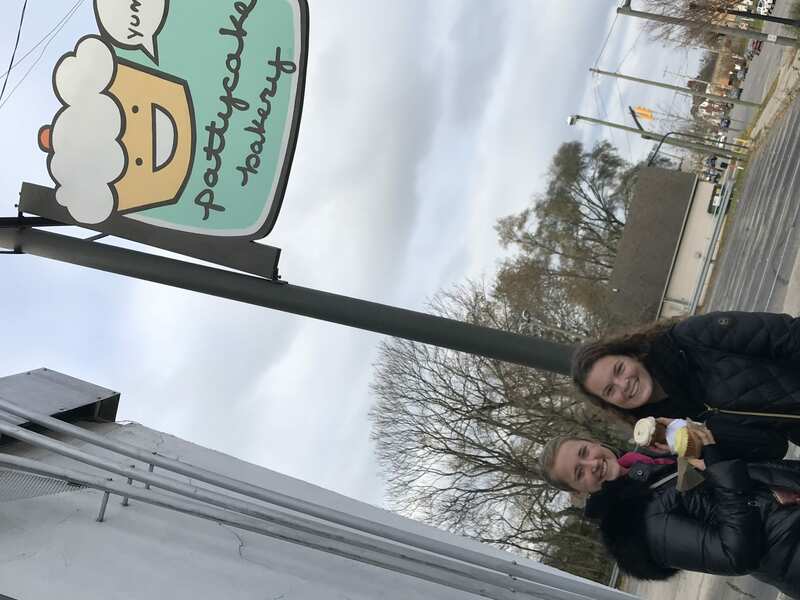 The fact that the bakery had a stop on the food tour was promising to how delicious their desserts must be, and we got to hear more about the production and ingriedients that go into almost all of their baked goods. There were so many different varieties of cookies, cakes, bars, and cupcakes to choose from making it a little overwhelming to pick out what I wanted. I asked the cashier what her favorites were, and she even had a hard time deciding; but, she did say that a customer’s all time favorite would be the sticky bun that is only made on Saturday’s. I would definitely recommend this to a friend, but without telling them it’s all vegan. 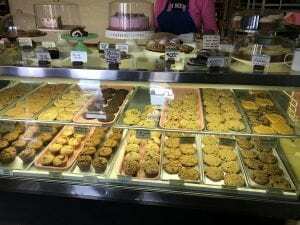 Many people make judgements off of veganism without even trying it, and this bakery deserves 5 stars. My current career path has me exploring the realm of medicine, my lifelong career of choice being a doctor. I have not chosen an exact field of medicine that I particularly want to go into, which is what medical schools recommend because as undergraduates we have had little to no experience in the actual setting of a doctor. Even though I don’t have a set plan, I can see myself working in a big hospital and being in charge of other doctors once I am an attending. OSU has a huge hospital on campus, and we are beyond lucky for it. The Wexner holds many opportunities for OSU students, but most are not attainable until junior or senior year due to the necessary prior education; this does not include volunteer opportunities, but that doesn’t mean all opportunities are available to younger people. To get a job as a doctor in a hospital, I must fulfill my undergraduate degree as well as my PhD in medicine. After that time, I will have to serve as a resident within a hospital working under many different branches, and they are usually not paid. After my time as a resident, I will either get a job at the hospital I did my residency with or I will have to go elsewhere; the medical field relies heavily on knowing people and making connections, which will “raise you on the totem pole.” To utilize my time here at OSU, I need to establish a strong connection to a professor who will be able to help me achieve my goals and act as a mentor, but also transcribe a personal recommendation. I want to get more involved in the Chemistry/Biochem club here on campus and make connections to upperclassmen who also can mentor me through my undergraduate education. Over the summer, I hope to volunteer at my local children’s hospital and have been lucky to shadow a primary care physician for 3 weeks, as well as time with a cardiologist. Another aspect of my education that sets me a part is my minor in Latin/medical humanities; this minor allows me to connect my keen attention to detail, from Latin, to the world around me, making it easier to analyze life’s situations. I also hope to study abroad, which will also broaden my horizons to how the world outside the US functions; this then can be applied to how differently people’s mind and bodies work in my life and career. My attainable goal is to work with sick children and their families; I have years of childcare experience and I enjoy my time around them. Personally, I only see myself going into the medical field; I have a keen interest in how the body works and the effects of mistreatment and abuse people have on their one and only body. For my second stop on the Columbus To Do, I decided to try the infamous donuts shop on campus called Buckeye Donuts. I went to this small and family owned shop with one of my suit-mates, Kaitlynn, and we spent over 10 minutes deciding on which donuts we wanted to try. The cashier was very patient with us, and answered all of our questions about the flavors. I chose the apple fritter donut, to keep me in the fall mood and Kaitlynn chose a pumpkin spiced donut topped with cream cheese frosting. 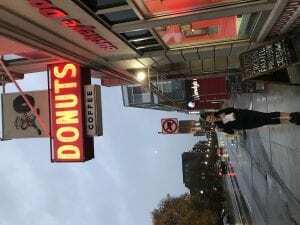 It was very overwhelming to be surrounded by donuts of all different shapes and flavors, but the experience itself was only joy! 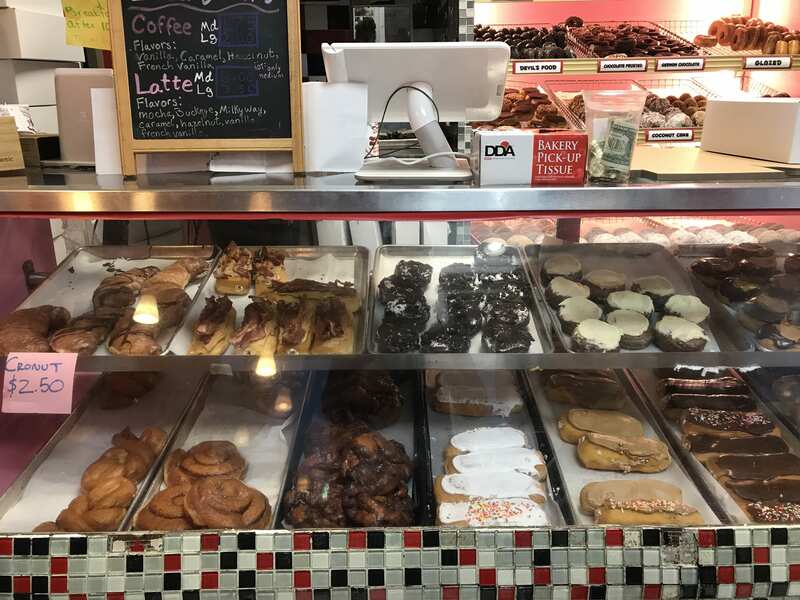 We are very lucky to have such a small, well-run, and delicious donut shop on campus, and I would most definitely recommend this shop to anyone who is traveling through Columbus or lives in the area! For my Columbus To-Do, I have chosen to visit different places that specialize in desserts! I have always had a sweet tooth, which is why I have chosen this category. I look forward to seeing all the bakeries and “sweets” places in Columbus, as well as exploring what else the city has to offer. With that, I hope to become more familiar with the city that will be my home for the next four years and comfortable navigating it on my own or with friends! My first stop on my To-Do list was Jeni’s Ice Cream on High St. 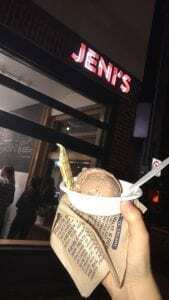 This was my first time having Jeni’s ever and it was amazing, just like what everyone said! I picked the vegan Dark Chocolate Truffle flavor and it was delicious. I got to visit Jeni’s with a friend from home and some of her other friends that go to OSU; it was a fun time getting to know new people and enjoying some quality ice cream! 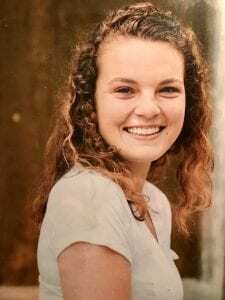 My name is Elise Hearty and I am a student at The Ohio State University. I am a student in the Arts and Sciences College with a major in Biochemistry. I chose Biochemistry as my major because I plan on going to medical school after my time at tOSU. I have always been more inclined and interested in math and science throughout my entire education; my intrigue in the medical field grew during high school and my time interning with a cardiologist and primary care physician. I love working with people in need, in particular those who are currently experiencing homelessness. During high school, I was involved in my school’s Labre program that interacted and helped the less fortunate of Akron, OH; I also volunteered in Akron at the Haven of Rest, a homeless shelter in Akron, and I hope to volunteer at the LSS during my time at OSU. A goal of mine while attending Ohio State is to become more involved in clubs and extracurriculars; I am to be a part of the OSU Exercise Science Club and I am a Scholar in the Environment and Natural Resources Scholars Group on campus. I believe to be “healthy” incapsulates not only physical health, but also mental and emotional; exercise and healthy eating is very important to me in that it sustains my body in all three of those categories. I hope to make an impact on tOSU’s campus academically, as well as on my peers through my leadership skills; I was able to partake in a pre-enrollment program here at tOSU known as the Leadership Collaborative where I developed my own leadership skills by listening and understanding what leadership means to faculty and staff at tOSU, as well as other leaders in the Columbus area.